Oplopanax horridus, Araliaceae; syn. Echinopanax horridus, Fatsia horrida is a large understory shrub endemic to the arboreal rainforests of the pacific northwest, but also disjunct on islands in Lake Superior. It is noted for its large palmate leaves and erect, woody stems covered in noxious and irritating spines. Could not help seeing in the Latin name the word “horridus”. From horreō (“stand on end, shiver”). It gets better with the adjectives associated with this word – rough, bristly, shaggy, rude, rough, uncouth, dreadful, horrid, frightful. My first encounter with it was in my pre-teen years while thrashing around in the pacific northwest brush. 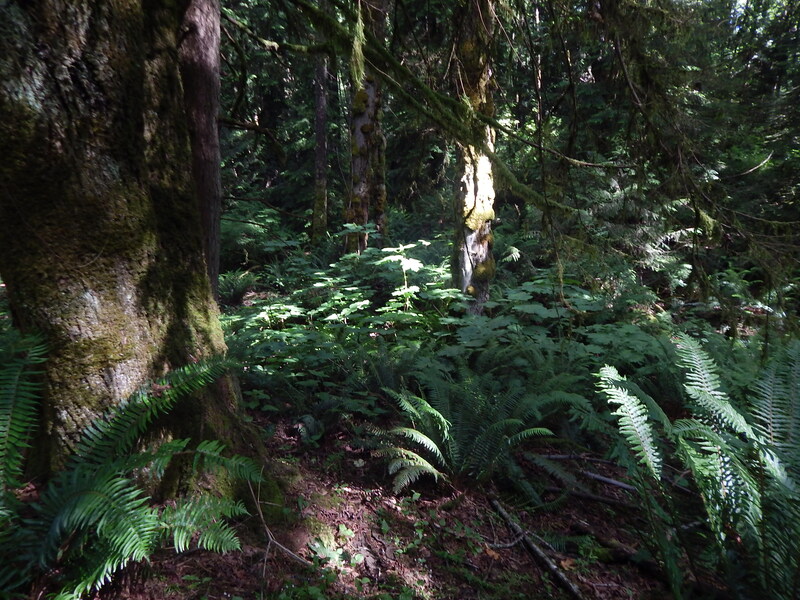 I was sliding down a ravine and grabbed onto this tall plant. OUCH!! It was full of thorns and I never repeated that mistake again. Thorny underside of Devil’s Club – don’t grab this plant! Even though I still roam quite a bit in the woods, I have not seen this notorious plant in many years. Then this week while traipsing around Cougar Mtn Park I saw this stand down in a creek bed. Don’t get me wrong with the definition of this plant as it is quite pretty with its big leaves and tall stance. 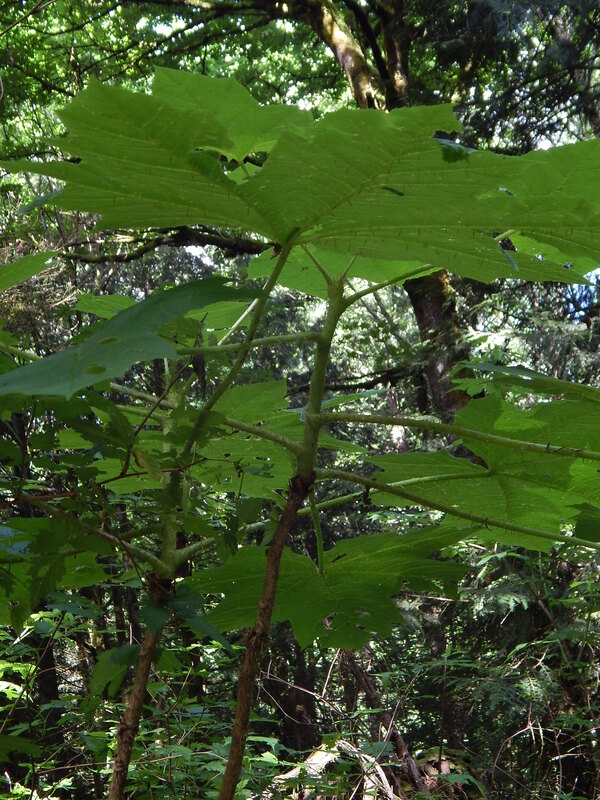 Devil’s club is related to American Ginseng, some think that the plant is an adaptogen. 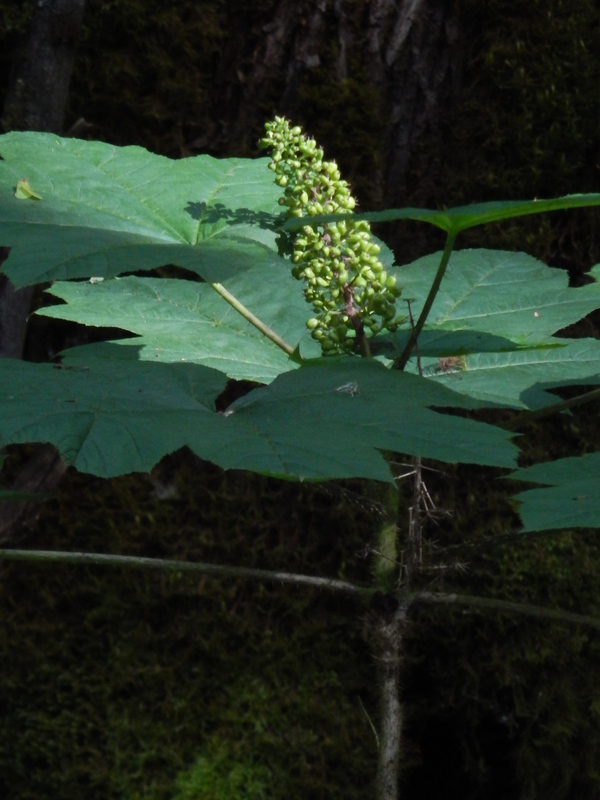 The plant has been harvested for this purpose and marketed widely as “Alaskan ginseng”, which may damage populations of Devil’s Club and its habitat. Devil’s club reproduces by forming clonal colonies through a layering process. What can appear to be several different plants may actually have all been one plant originally, with the clones detaching themselves after becoming established by laying down roots. After seeing this first patch of giant leaves and prickly tall stems I started seeing more patches. This was a Devil’s Walking Stick aficionado’s bonanza. Devil’s Club large leaves and berries on spiny tall stalk.